Evelyn Caroline Laursen Goodwin passed peacefully February 3, 2019 in Tooele Utah surrounded by her family. Evelyn was born April 21, 1933 in Hyde Park Utah. She married the love of her life, Ronald Goodwin February 26, 1951. They were later sealed for time and eternity in the LDS Temple. Evelyn was a kind and gentle soul who loved her family deeply. She was well loved by all those who were blessed to come into her life. 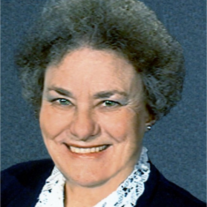 Evelyn was a devoted member of The Church of Jesus Christ of Latter-Day Saints, a loving wife, mother and grandmother, an excellent and well-respected Real Estate Broker and great friend to all. She found joy in spending time with her family, a good book, and loved her work in the real estate industry. She is survived by her children Douglas (Darla) Goodwin, Michael Goodwin and Vickie (Michael) Roper, grandchildren, great grandchildren and great great grandchildren. A graveside service will be held at Hyde Park Cemetery on Friday, February 8, 2019 at 2:00 pm.